The habenulae are part of a highly conserved conduction system, the dorsal-diencephalic conduction system (DDC), that interconnects sites in the limbic forebrain with the ventral midbrain and hindbrain (Bianco & Wilson, 2009). The paired habenula nuclei exhibit several left-right asymmetries. Displaying differences in the proportion of neuronal subtypes with distinct patterns of gene expression, axon terminal morphology and connectivity (Bianco et al, 2008, Roussigne at al, 2009). The habenulae have been shown to be important in a range of behaviours. Their regulation of monaminergic activity in the midbrain is important for the modulation of fear behaviours, avoidance learning and attention (Agetsuma et al, 2010). As would be expected of a regulator of monoaminergic activity they also have been implicated in psychosis, depression, anxiety, schizophrenia and addictive behaviours. They also play a role in circadian rhythms, sleep initiation and duration and reproductive and maternal behaviours (Bianco & Wilson, 2009, Hikosaka, 2010). The neuroanatomical asymmetries of the habenula can also lead to a lateralisation of certain behaviours (Barth et al, 2005). The habenulae are spheroid nuclei. Habenular neurons are mono-polar.. The cells direct their dendrites inwards forming an internal neuropil core that the cell bodies surround. Single-depth confocal section through the habenulae of a 4 dpf Tg(ET16:GFP) transgenic larva in which a subset of habenular neurons express GFP. In each nucleus the neuronal somata are arranged as ovoid shells surrounding a central neuropil domain. It is in this domain that neurons elaborate their dendritic arbors(Image courtesy of Isaac Bianco taken from Bianco et al, 2008). A Left habenular neuron visualised by focal electroporation with a construct driving the expression of membrane GFP. Habenular cells have a rounded nucleus and are mono polar, projecting their dendrites inwards to form the dense neuropil of the habenulae (Image courtesy of Isaac Bianco taken from Bianco et al, 2008). In the zebrafish, the left habenula receives projections from the left-sided parapineal organ that promotes the elaboration of left sided habenular identity (Bianco et al, 2008). At later stages, in both habenulae a dorsal and a ventral habenular subnucleus(vHb) can be distinguished. The ventral subnucleus is homologous to the lateral mammalian habenula and the dorsal habenula is homologous to the medial mammalian habenula. The dorsal habenula can be further subdivided into lateral and medial subnuclei (dHbL,dHBM). (Amo et al, 2010). A dorsal view of the epithalamus showing the left sided parapineal nucleus innervating the left habenular. The left-sided parapineal organ that promotes the elaboration of left sided habenular identity (Image courtesy of Miguel Concha, Concha et al, 2003). Schematic showing a transverse section through the adult habenular nuclei. This schematic shows the arrangment of the dorsal and ventral habenular subnuclei, the dorsal nucleus is further subdivided into medial and lateral subnuclei (See Development section to see the morphogenetic movements that result in this adult arrangement)(Schematic adapted from Amo et al, 2010). This Figure shows a dorsal view of a 4dpf Tg(mp558b:GFP) embryo labelled with anti-acetylated tubulin(red) and SV2(blue). The anti-acetylated tubulin antibody labels axonal tracts and the SV2 antibody labels synaptic neuropil. This line expresses GFP only in the left dHbL nuclei. In panels B & C the same confocal stack has been rendered into 3D. By rotating the stack to the right we can see the synaptic neuropil of the three subnuclei and their relative positions at this stage of development. In panel C, the region that would be GFP positive is indicated by the dashed white line. The habenulae are part of a system that relays information from the telencephalon and entopeduncular nucleus in the forebrain to the interpeduncular nucleus and to the raphe nucleus located in the midbrain/hindbrain. The afferent fibres from the telencephalon/ entopeduncular nucleus reach the habenulae via the stria medullaris. The projections of the habenula to the interpeduncular nucleus and raphe nucleus travel in the fasciculus retroflexus. In zebrafish there are obvious anatomical asymmetries between the left and right habenulae. This can be seen in the differing size and shape of the neuropil in the left and right habenulae. The dHbM and dHbL subnuclei also have different size ratios on the left and the right and innervate different regions of the IPN. While the dHbm subnucleus is the main source of projections to the ventral region of the IPN the dHbL subnucleus projects mainly to the dorsal IPN (Agetsuma et al, 2010). Dorsal view of a 4dpf wt embryo labelled with sytox nucleic acid stain, anti-acetylated tubulin(red) and SV2(blue). The spheroid nuclei of the habenulae can be seen surrounding a dense core of neuropil that is larger in the left habenular than in the right and differently shaped. Left-right asymmetries in the telencephalon-habenula-IPN pathway. Single cell electroporations of habenula neurons showed that habenular efferents have two distinct patterns of axonal arborisation in their terminals in the IPN. Axons coming from the left-sided habenula neurons terminate predominantly in the dorsal IPN. Three-dimensional reconstructions of these L-typical arbors reveal them to be formed like a 'domed crown' with branches extending over considerable DV depth. Their terminals circle the IPN and extend colaterals directed internally into the IPN.Right-sided habenula neurons predominantly terminate in the ventral IPN. Their axon terminals also surround the IPN but in a more ovoid-like shape “reminiscent of an electromagnetic coil. They look a lot flatter than the L-typical arbors, extending over less depth. The branches of the right axons concentrate more in the periphery, with relatively few branches in the centre of the IPN. Although these single cell electroporation experiments have not yet been carried out in transgenic lines labeling specific habenula subnuclei the results of Bianco et al, 2008 correlate well with later studies describing the innervation of the IPN by the lateral and medial dorsal habenula nuclei. From bulk labeling experiments, results suggest that the left habenular nucleus innervates the dorsal IPN and the right habenular nucleus innervates the ventral IPN. In Agetsuma et al, 2010 the habenula-IPN projection pattern in the adult is shown. Instead of bulk labeling the entire habenula nuclei with DiI, the dHbL and dHbm and their efferents are labeled in the double transgenic Tg(narp:GAL4VP16; UAS:DsRed2; brn3a- hsp70:GFP) fish. In the adult the Narp expression selectively labels the dHbL subnucleus, which is much larger on the left-side. Axons from this subnucleus terminate predominantly in the dorsal IPN. The Brn3a:GFP expression labels the dHbM, the terminals of these nuclei innervate the ventral IPN primarily. In the adult there is also an intermediate zone of the IPN where in the Tg(narp:GAL4VP16; UAS:DsRed2; brn3a- hsp70:GFP) red and green terminals overlap. The application of anterograde tracers to the dIPN showed that efferents from this region project to the dorsal raphé and continue on to terminate in the griseum central (GC)which corresponds to the mammalian periaqueductal gray (PAG), dorsal tegmental nucleus and nucleus incertus. These areas in mammals have been linked to the control of behaviour in fearful or stressful conditions. Manipulation of the dHbL-dIPN pathway with tetanus toxin light chain biased the fish towards a freezing behaviour as opposed to the normal flight response when subjected to cued fear-conditioning. This corroborates that in zebrafish the dHbL-dIPN –GC pathway, as in mammals, is involved in the modification of behavioral responses in an experience-dependent manner (Agetsuma et al, 2010). Unlike the dorsal habenular nuclei the ventral habenular nuclei are symmetric, the vHb projects via the fasiculus retroflexus(FR) to the ventral part of the median raphé. The efferents travelling in the FR are arranged with the dHb efferents forming the core of the tract while the vHb efferents form a sheath surrounding them(Amo et al, 2010). Schematics showing a summary of the main afferent areas to the habenula from Turner et al., 2016. (K: outline of the brain in lateral view, L: boxes diagram). (K) The brain nuclei that project to the habenula are shown as colored areas. (L) Boxes represent main nuclei projecting to the habenula, while arrows represent projections. Asymmetric projection from the parapineal (PP) to left habenula (lHB) is shown with a blue arrow. Asymmetric projection from mitral cells of the olfactory bulbs (OB) to right habenula (rHB) is shown with a pink arrow. All other afferent areas that seem to innervate both left and right habenula are represented with black arrows. By observing the expression patern of the vHB specific marker Diamine Oxidase(dao) throughout development it is possible to see that the dorso-ventral orientation of the fish habenula is a result of a morphogenetic process. At 5dpf expression of dao in the primordium is lateral to the dorsal habenular nuclei. This region then migrates ventro-medially to result in the arrangement we observe in the adult zebrafish. Schematic showing the relative positions of the dosal and ventral habenulae subnuclei at different stages of development. At 5dpf the vHb subnucleus is lateral to the dorsal habenular nuclei in the habenular primordium. This region then migrates ventro-medially to result in the arrangement we observe in the adult zebrafish. dHb (blue) and vHb(orange)(Schematic adapted from Amo et al, 2010). Amo et al, 2010 http://www.ncbi.nlm.nih.gov/pubmed/20107084. The hypothalamus is the largest and most ventral division of the diencephalon. It's name means "below the thalamus" however this anatomical position applies only to the rostral regions as the more caudal areas are actually below the mesencephalic tegmentum. The hypothalamus arises near the end of the segmentation period (Kimmel et al, 2005) and it gives rise the tuberal nuclei, the inferior hypothalamic lobes and the neurohypophysis of the adult (Meek and Nieuwenhuys, 1998). The hypothalamus is the master regulator of endocrine and autonomic function within the brain (Mathieu et al, 2002). In the adult, the olfactory bulbs are paired protrusions in the anteriormost region of the telencephalon. They recieve primary sensory input from the olfactory epithelium directly via the olfactory nerve (Cranial nerve I). Cytoarchitecturally the bulb is arranged into four concentric layers. 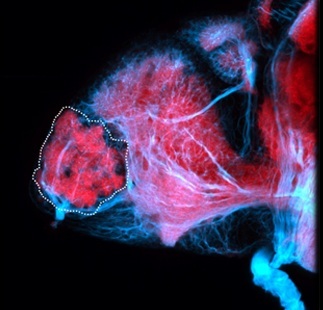 Lateral view of a 5dpf zebrafish brain labelled with SV2 and tubulin antibodies showing olfactory nerve(blue) and glomeruli (pink). 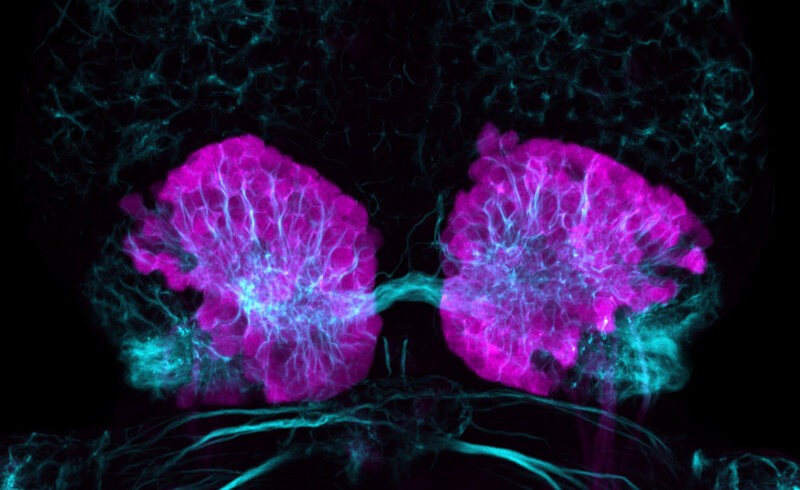 Frontal view of 4dpf zebrafish labelled with anti-tubulin showing the olfactory nerve emanating from the olfactory epithelium and entering the bulb where individual olfactory sensory neurons contact individual olfactory glomeruli. In the olfactory bulb there are three main cell types: mitral cells, ruffed cells and granule cells. In addition to these there is also a population of catchecholaminergic cells that are often referred to as either juxtaglomerular or periglomerular cells (Byrd and Brunjes, 1995; Fuller et al., 2005 and 2006)). In the mature olfactory bulb, the different cell types that form the olfactory bulb are organised into four concentric layers (from external to internal layers). This is the outermost layer of the olfactory bulb and contains axon terminals of the olfactory sensory neurons (OSNs). Each of these OSNs expresses a single olfactory receptor (OR) on its surface in the olfactory epithelium. An enormous array of odorants can be detected by the large repertoire of different ORs expressed by OSNs (Sato et al., 2007). The axons of the OSNs come together and fasciculate to form the olfactory nerve (Cranial Nerve I) that projects into the olfactory bulb. Once inside the bulb the olfactory nerve axons defasciculate and spread over the glomerular layer of the olfactory bulb to form the outer layer of primary olfactory afferents. Primary olfactory afferents branch conspicuously and synapse onto the dendrites of the mitral cells to form a specialised spherical structure named an olfactory glomerulus. The layer containing all these olfactory glomeruli is known as the glomerular layer. The Mitral or External Cellular layer is formed mainly by mitral cells, although ruffed cells can also be found in this layer (Fuller et al., 2005 and 2006). Both cell types are projection neurons and use glutamate as a neurotransmitter. In fish, individual mitral cells project several dendrites onto multiple glomeruli, whereas in mammals, single mitral cells project a primary dendrite onto a single glomerulus. Thus, a single fish mitral cell receives sensory information from several different odorant receptors (Yoshihara et al, 2001). The apical dendrites of the mitral cells ramify and establish synaptic contact with axons of olfactory receptors to form the olfactory glomeruli. Their axons project via the lateral and medial olfactory tracts to bilaterally symmetric fields within the telencephalic lobes. These telencephalic regions are interconnected by mitral cell axonal processes that project through the anterior commissure. The fasciculated axons of the mitral cells extend posteriorly and dorsally to the habenula via the stria medularis where they cross to the contralateral side via the habenula commisure (Miyasaka, 2009). Some of these axons asymmetrically innervate the medial portion of the central neuropil domain of the right habenula. These mitral cells are labelled in the transgenic line Tg(lhx2A:GapYFP) (Miyasaka et al, 2009). Ruffed cells are less numerous than mitral cells. Ruffed cells have short collaterals in the proximal region of their axon, which gives these cells their characteristic appearance (Fuller et al., 2005). The Granule cell layer or Internal Cellular layer is mainly composed of granule cells, which act as interneurons in the olfactory bulb circuitry. These cells have apical dendrites that contact mitral and ruffed cells, while their basal dendrites contact axons originating from extrabulbar regions. They express the neurotransmitter gamma-aminobutyric acid (GABA). A subpopulation of granule cells produce catecholamines and are tyrosine hydroxylase positive. These cells are referred to as juxtaglomerular, periglomerular or perinest cells (Byrd and Brunjes, 1995; Fuller et al., 2005 and 2006). The adult zebrafish OB contains another subset of neuroendocrine cells that express Gonadotrophin releasing hormone(GnRH). These cells are known as terminal nerve cells. These neurons are born near to the olfactory epithelium and then migrate along the axons of the olfactory sensory neurons to populate the bulb (Whitlock et al., 2003; Palevitch et al., 2007). abbreviations: GC granule cell; GL glomerular layer; ICL inner cellular layer; MC mitral cell;MCL mitral cell layer; NI cranial nerve I/olfactory nerve; ONL outer layer of primary olfactory afferents; OSN olfactory sensory neuron; PC periglomerular cell. The olfactory bulbs along with the rest of the telencephalic lobes originate from the anterior neural plate. At 1dpf and 2dpf, the prospective olfactory bulb is located in a dorsoposterior region of the telencephalon, adjacent to the diencephalon. From 2dpf to 5dpf, an anterior morphogenetic movement brings the olfactory bulb rostrally to its characteristic position as the anteriormost structure of the brain and away from the diencephalon. By 2dpf all major neuronal types are present and have elaborated processes so that a number of glomeruli can also be seen. Cartoon showing the position of the olfactory bulb at three different stages of the zebrafish development (2dpf, 3dpf and 5dpf). The olfactory bulb is located in a dorso-posterior position in the telencephalon at 2dpf, but later in development (5dpf) acquires its characteristic anterior position. Lateral key: At this stage of development (4dpf) The paired olfactory bulbs are the most anterior region of the telencephalon. The olfactory bulbs are involved in olfaction and the detection of odours. Dorsal key: At this stage of development(4dpf) The paired olfactory bulbs are the most anterior region of the telencephalon. The olfactory bulbs are involved in olfaction and the detection of odours. The Pallium is a dorsal division of the Telencephalon (also called the dorsal telencephalon). The pallium is generally subdivided in a number of areas, named by their topographical position within the telencephalon (Dm, Dd, Dl, Dc and Dp) (see Wullimann et al., 1996). Although projection neurons of the olfactory bulb are pallial derivatives, the olfactory bulb is considered as a separate structure and it is described in its own section (see olfactory bulb). Also known as the emminentia thalami. The thalamic eminence is part of the diencephalon and lies ventral to the ventral thalamus and dorsal to the preoptic area. This region gives rise to the ventral entopeduncular nucleus that extends into the telencephalon and straddles the diencephalic/telencephalic border. The ventral entopeduncular nucleus is a major afferent nucleus to the habenulae. Afferent Connectivity of the Zebrafish Habenulae. Wullimann, M.F. & Mueller, T., 2004a. Identification and morphogenesis of the eminentia thalami in the zebrafish. Journal of Comparative Neurology, 471(1), pp.37–48. What is the thalamus in zebrafish? The distribution of GAD67-mRNA in the adult zebrafish (teleost) forebrain reveals a prosomeric pattern and suggests previously unidentified homologies to tetrapods. The Journal of comparative neurology. 2009;516(6):553-568. doi:10.1002/cne.22122. The posterior neuromere of the forebrain that gives rise to the optic cups, epithalamus, thalamus, ventral thalamus and hypothalmus. Formed from the rostral-most neuromere, the telencephalon in zebrafish consists of the olfactory bulbs, dorsal telencephalon or pallium and the ventral telencephalon or subpallium. The teleost telencephalon is formed by two solid telencephalic lobes separated by a T-shaped ventricle. This "everted" morphology is in contrast with most other vertebrates where the telencephalon forms by a process of evagination resulting in hollow telencephalic lobes surrounding a central ventricle. has parts: dorsal telencephalon, olfactory bulb, telencephalic ventricle, telencephalic white matter, ventral telencephalon. Folgueira M, Bayley P, Navratilova P, Becker TS, Wilson SW, Clarke JD. Morphogenesis underlying the development of the everted teleost telencephalon. The ventral telencephalon or subpallium is a ventral division of the Telencephalic Lobes. The subpallium is generally subdivided in a number of areas named by their topographical position in the telencephalon (Vd, Vv, Vc, Vl, Vs and Vp).